It is often the case in showbusiness that successes come in pairs. If something - some film, some band, some actor - makes a success of themselves then, hot as hot can be, on their heels will follow some shameless imitation. It happened in the 90s with the asteroid-themed bonanzas Deep Impact and Armageddon. When Sharknado made a surprise success of itself in 2013, it prompted a slew of 'vaguely-dangerous animal crossed with vaguely-dangerous weather event' rip-offs - including my, as yet still to be produced, screenplay, Horse Blizzard (any interested financiers, please, feel free to get in touch, please). When Mary-Kate Olsen first burst onto the scene, well, it was only a matter of days before Ashley Olsen is right there with her, trying to make name for herself... Though I will concede that the particulars of this last example have some mitigating circumstances. Some of you may remember last week when a small brown and black dog made its way onto an Ianród Éireann commuter train, that was bound for Dublin, at a train station in Kildare. The dog, upon boarding the train, hoiked itself up onto a seat, and proceeded to ride the rails to the train's terminus in Heuston. It was then interned by staff at Heuston Station where they shared a plea over social media to help locate the dog's owners. The plea went viral and lo' a star, provisionally named 'Hamish' - but actually named 'Tyson' - was born. All very well and good, you might think. It was a story that, briefly, united a nation, as we came together as one to help this stranded hound. Well, now this absolute chancer (photo below), has attempted to get in on the limelight. 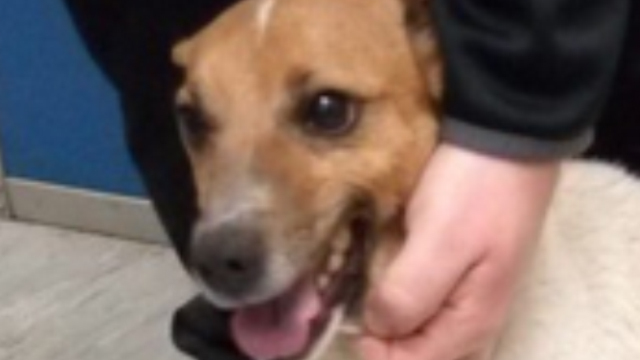 The - as yet - unnamed Jack Russel was taken in by staff yesterday evening at Heuston Station after apparently disembarking from a Red Line Luas. And, much as it pains me to admit, kudos where kudos is due - this lil' fella did at least realise that he couldn't simply copy exactly the story of dear Hamish. Should he have also boarded a commuter train so as to end up in Heuston, people would've immediately seen through the ruse and sniffed him out for the shameless coat-tail rider that he is. No, instead he realised he needed to bring a splash of originality to Hamish's tried and tested recipe - cue the ol' Red Line Luas. This Jack Russel is not to be underestimated, a sly customer indeed. Though please retweet to help find the owner.